Saturday December 9 1911 I was busy with the work all forenoon. Had dinner early Jimmie & I both went to town at 1.15. I took the sheet I made for the Bazaar out to Carrie Andreson and called on Mrs. Weld on Dodge St. It began to rain as I came home at 4.40 Jimmie came an hour later. I was busy till late bed-time It was still raining It was thirteen years today that Edith died. I was so cold. Sunday December 10 1911 It was a windy disagreeable day. I wrote to Lydia Alice Condon Sallie Reed Lou Reeves & Will. I read some in the evening. 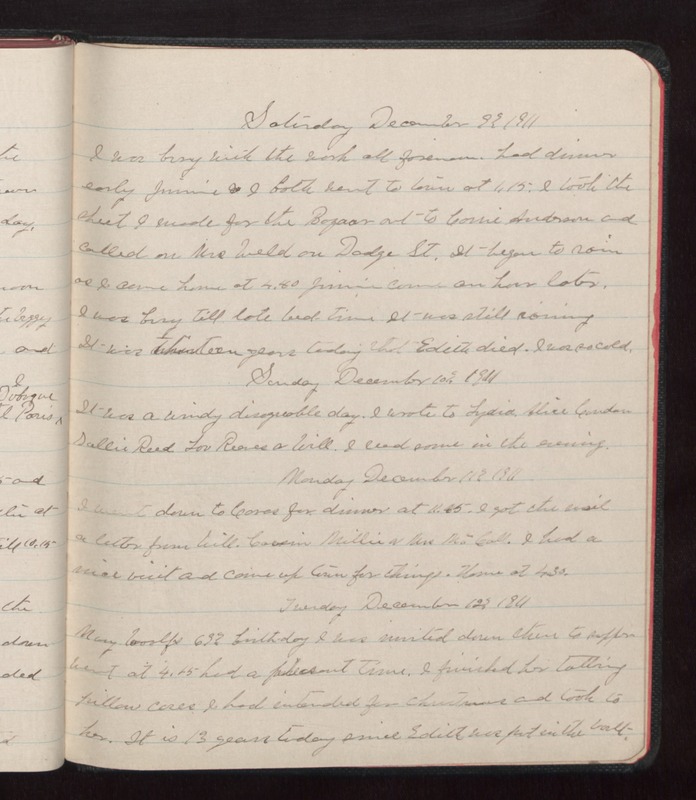 Monday December 11 1911 I went down to Coras for dinner at 11.15. I got the [illegible] a letter from Will. Cousin Mollie & Mrs. McCall. I had a nice visit and came up town for things. Home at 4.30. Tuesday December 12 1911 Mary Woolfs 69th birth-day I was invited down there to supper went at 4.15 had a pleasant time. I finished her tatting pillow cases I had intended for Christmas and took to her. It is 13 years today since Edith was put into the vault.